When it is searing hot, like it is in Cape Town at the moment, soup is the last thing anyone feels like. For me however there are two exceptions; gazpacho naturally but also Tom Kha Gai which is my absolute favorite Thai soup of all time. 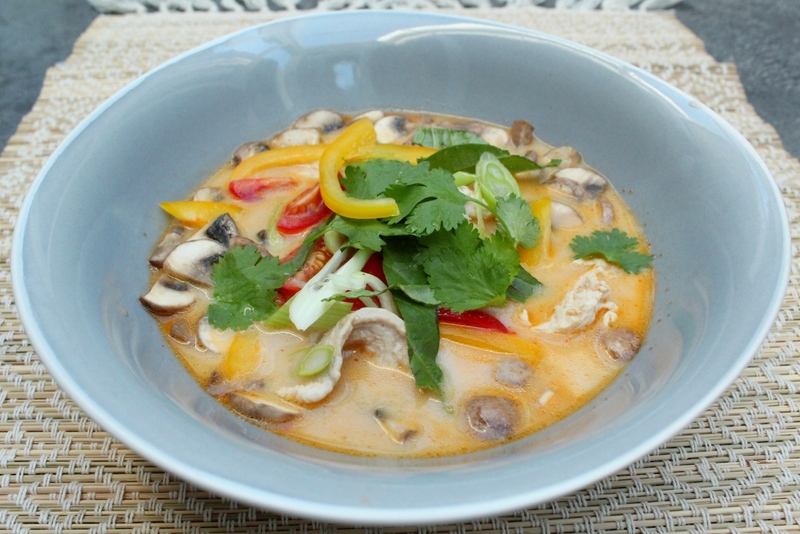 It is a chicken and mushroom soup with a coconut milk broth base, flavored with lime juice and lemongrass. I add a few extra veggies, which are not part of the traditional recipe, to add crunch and colour. This soup is so refreshing with its spicy zesty flavor that, in my opinion, it is a perfect summer starter soup, or even as a main course for a two course meal. In a medium pot over high heat, combine the coconut milk, stock, ginger, lemongrass, lime leaves, lime juice, fish sauce, sugar and chilli; bring to a simmer. Allow this to simmer for 5 – 10 minutes while you chop the chicken and veggies. Taste and adjust the seasoning. Strain the soup through a sieve. Add the chicken and mushrooms and simmer until the chicken is just cooked. Add the peppers and tomato and stir to heat through. Serve immediately into bowls. Garnish with the spring onion and coriander.